Swimming pool, Chinese and western restaurants, lobby bar, concierge service, ATM banking, currency exchange, gymnasium, health spa, sauna and massage center, private beach, billiards, tennis, game room, beauty salon, tour assistance, babysitting, limousine service, safe-deposit box, tour assistance, free parking, medical care on call, meeting room, business center, audio-visual equipment. Swimming pool, gymnasium, health spa, sauna and massage center, game room, billiards, tennis, karaoke. 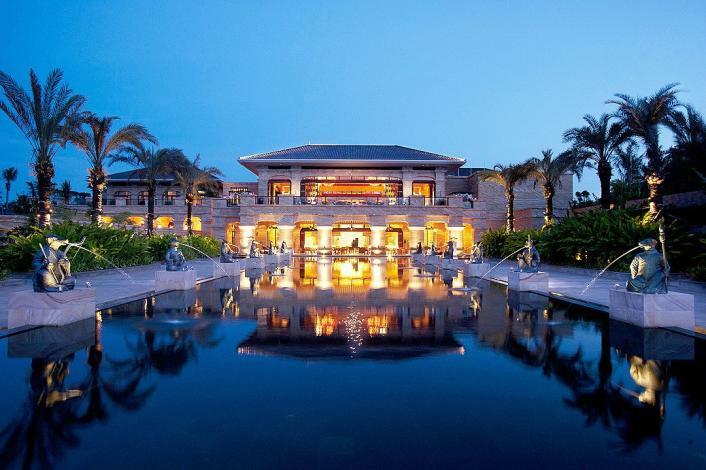 The Conrad Sanya Haitang Bay (Sanya Haitangwan Kanglaide Jiudian) is situated in the middle of scenic Haitang Bay some 28 km (17.5 mi) east of Sanya city. Various secluded villas are built in European-style architecture, set amid landscaped tropical gardens leading down to a pristine beach. Each villa is furnished with a private pool, sun lounge and cabana surrounded by luxuriant foliage for complete privacy. All villas and rooms afford stunning views of the South China Sea or lush gardens. The room amenities are of the highest standard, with LCD flat-screen televisions, surround sounds, on-demand movies, ergonomic desk chairs, 400-thread count sheets, high-speed internet access and much more. Diners will find plenty of culinary delights in this Sanya hotel. The Teatro serves a wide selection of authentic Asian and international dishes. Chefs in the La Chine present diners with contemporary Hainan and Cantonese cuisines. The Senses offers grilled meats and fresh local seafood. The Vue Lounge is the place for snacks, afternoon tea and evening cocktails Those organizing meetings, presentations and other events have a wide range of on-site function rooms and access to its neighboring sister resort's grand ballroom, complete with a large foyer. A fleet of Bentleys are also at the service of guests. In terms of recreation, guests can work out in the fitness center and have a dip in two swimming pools; one swimming pool on the white sandy beach with its own safe ocean swimming area and a range of water sports on offer. The Spa is a deluxe retreat offering a wealth of personalized treatments and therapies to relax and rejuvenate the body. There's also easy access to tennis courts and a kids paradise in the neighboring sister resort. Guests may enjoy the latest movie and arcade games at the Wanda Haitang Bay International Club in the nearby building of Doubletree Resort. - 40 km to Phoenix International Airport.